Fort Hancock was established along the El Paso to San Antonio road as Camp Rice on June 9, 1882. It was moved from the former site of Fort Quitman. It was established by a troop of the 10th U.S. Cavalry "Buffalo Soldiers". It was never a large Post rarely having more than sixty men. It was designated Fort Hancock in 1886 after the death of General Winfield Scott Hancock, a hero of the battle of Gettysburg. The fort was damaged in a flood that year, but rebuilt. It was damaged again in a flood in 1894, then abandoned December 15, 1895. The location of the post today is a cottonfield about one and one half miles west of the town of Fort Hancock. 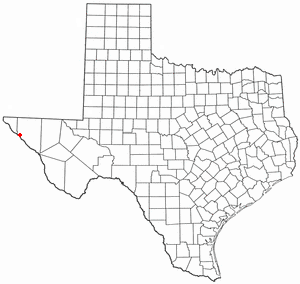 Fort Hancock is a census-designated place (CDP) in Hudspeth County, Texas, United States. The population was 1,713 at the 2000 census. Fort Hancock and El Porvenir, Chihuahua area is connected by the Fort Hancock-El Porvenir International Bridge. Here's the our members favorite photos of "Cities in Texas". Upload your photo of Fort Hancock!